Ecohouzng 36 inch Oscillating Tower Fan is perfect for a wide variety of areas and it's easy to get exactly the coverage. This fan features oscillation which provides horizontal movement simultaneously to creating more ventilation across the room. Constructed with durable material to increase the level of durability and reliability, and helps to keep the fan in good operating condition for a long time. Additional functions such as 3 speed setting, 8 hour timer delay, remote control, sleep mode for user convenient and efficient. Advanced tower style fan includes user-friendly digital control panel, along with full-function remote control. This slim, extra tall vertical fan takes up little floor space yet provides an effective cooling breeze over a broad area. M18 18-Volt Lithium-Ion Cordless Jobsite Fan (Tool-Only) The M18 Jobsite Fan provides the most powerful airflow, and unmatched runtime in a compact size. The fan can circulate air over 40 ft., making it ideal for drying or cooling on a variety of sites. Powered by a M18 REDLITHIUM battery, the Jobsite Fan delivers up to 17 hours of runtime on low for all day runtime on a single battery charge. It also features a 120 adjustable head, 9 stopping positions and three speed settings, which provide optimal airflow control. Battery and charger sold separately. M18 18-Volt Lithium-Ion Cordless Jobsite Fan (Tool-Only) is rated 4.7 out of 5 by 478. Rated 5 out of 5 by HomeDepotCustomer from Amazing fan and battery that last all night ! ... Amazing fan and battery that last all night ! Rated 5 out of 5 by Eric from This fan is amazing, easily feel air flow from 15feet away. I run it off the ac power while it's... This fan is amazing, easily feel air flow from 15feet away. I run it off the ac power while it's on my tool box but if I need it inside a car I can pop in a battery and go. The 5.0 battery lasts several hours on high. Rated 5 out of 5 by Buildthewall from Great tool. Love it.... Great tool. Love it. Rated 5 out of 5 by Terryk from Thus is my second one purchased. They work great!... Thus is my second one purchased. They work great! Does this fan come with a battery and charger? Is it included? 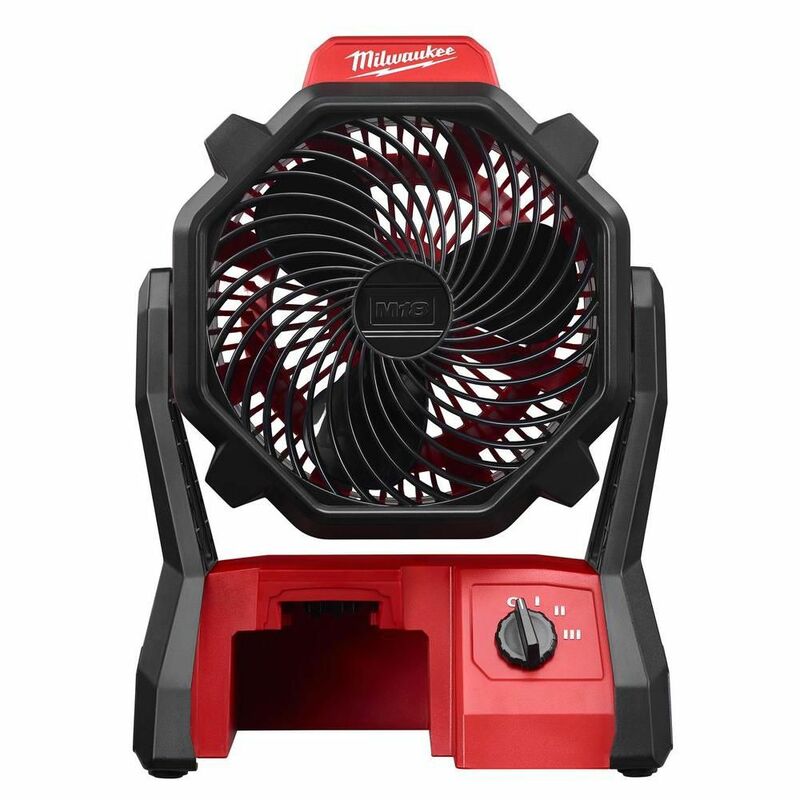 Hi Char, The Milwaukee M18 Jobsite fan does not come with a battery or charger. However, our fan does have an AC adapter built-in for extended use.